Posted by marijnkuiper in Breakfast., Food facts. You guys will sure notice what I love most to use in my breakfast: oatmeal. It really is one of the best ways to start your day. I read somewhere a while ago oats are really healthy so I started to try it and I just never stopped. There really are countless variations what to do with it, just old fashion oatmeal cooked with water or milk, oatmeal pancakes, oatmeal cakes, oatmeal cookies and so on. But why is it so healthy? First of all, why oats are good if you want to lose weight: They are low in fat, it are complex carbs (yes the good ones) and it’s best to eat most of your carbs in the morning so you’ll get energie and you’ve got all day to burn them, they are high in fiber what will make it take longer to digest so you will feel full longer and it’s a good protein source and your muscles need protein if you work out. Besides that is oatmeal high in vitamin E, it lowers cholesterol and it reduces risk of heart disease (Yes, thank you Google). There are a lot of different names and types of oatmeal what can be a bit confusing. In my recipes I use two kind of oatmeal, rolled oats and quick oats (you’ve also got steel-cut oats but I’ve actually never really tried to use them). 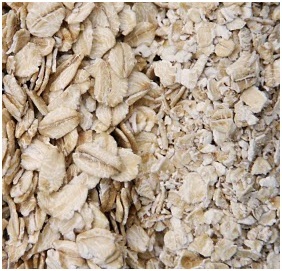 Rolled oats (left on the picture) are also called old-fashioned oats, it are oats steamed, pressed and then dried. When you cook them they fairly maintain their shape. Instant oats (right on the picture) are also called quick oats, they are pressed thinner than the rolled ones, cook quicker and get softer. In most recipes it doesn’t really matters which one you use, I mostly use just what I have at that time. But for example for oat pancakes are the instant oats better because you get a smoother dough and to make oven baked oatmeal I mostly use rolled oats. What I love most about oatmeal is that you can really do anything with it. The opportunities are endless. So be prepared for a lot of oatmeal recipes!